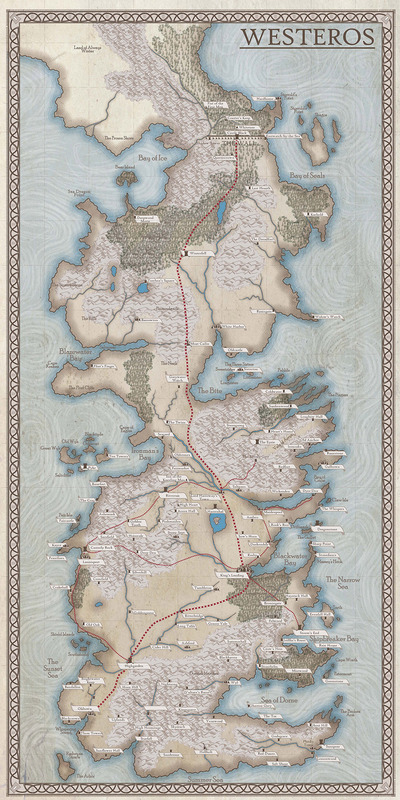 A few years back in the lead up to Game of Thrones: Season 1 I decided to make a map of Westeros. This was before we had the awesome Song of Ice and Fire maps. I also wanted to print it out on our large format printer at work (we’re talking 48″ by 80″ or some such nonsense). I started to make it in Photoshop, but the resolution needed was too large for my computer to handle. So I made it in illustrator so it was VECTOR BASED. It was also an awesome way to learn some fun tricks with brushes, symbols and patterns. 5 seasons and a much more powerful computer I dusted off the old file and thought I would post it. This is also because I am working on an awesome project that uses some of these skills (it may or may not involve laser cutting). More on that in the future! For now you can find the PDF here. Also, the inspiration / base I used for this map comes from this thread! WAY BETTER MAP.